“Bengaluru is the most dynamic city when it comes to Pinkathon” says Milind Soman, Founder. Bangalore, Nov. 20, 2018. With the seventh edition of Pinkathon set to be held on Jan. 27, 2019 at Sree Kanteerava Stadium, the founder of Pinkathon, Milind Soman, called upon the marathoners all over the city to gear up and start training for their goal distance. 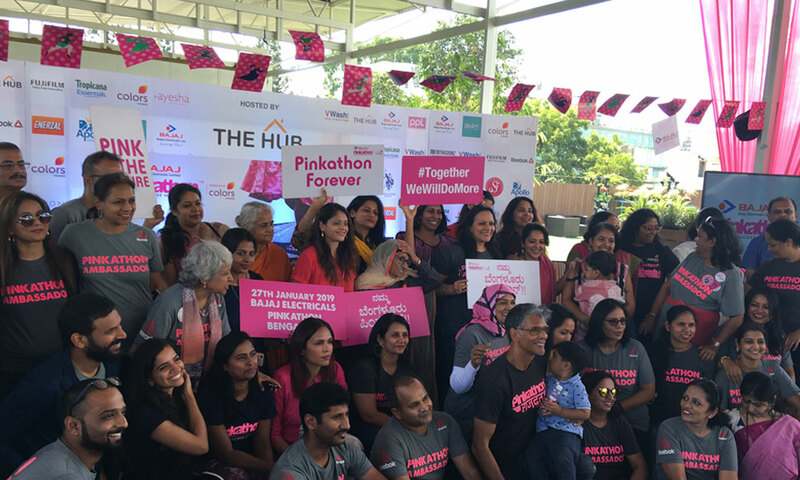 The inaugural event, held at The Hub Terrace, Safina Plaza this morning, saw a panel of six awe-inspiring women from Bengaluru who, in spite of being in the most difficult situations in their lives, conquered it and came out as true “Pinkathoners”. One of the panelists and the mascot for the 21 km category run, Smita Amdekar, shared her story of fighting a rare form of cancer and still completing her marathon after post-treatment. Also present among the panelist was Mann Kaur, a 103-year-old woman who started running at 93 and holds the world record in the over 100 years category. Recently, she won two gold medals in a tournament in Spain in 100 meters run and javelin throw. Last year 3,000 women participated in the 10k category. Soman adds, “One of the main driving forces of Pinkathon is inclusivity. 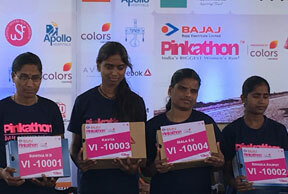 Women who are normally isolated – housewives, baby bearing mother, pregnant women, physically challenged, Pinkathon encourages them to take their health in their own hands. Pinkathon, sponsored by Bajaj Electricals and Apollo Hospitals, primarily focuses on breast cancer awareness. The hospital provides free health check-up to all the participants and free mammogram to participants above 45. Bangalore has the highest number of breast cancer patients in the county. 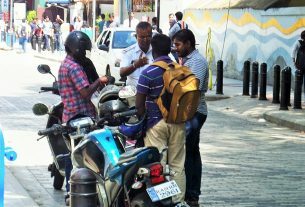 The Karnataka Cancer Association has recorded almost a 50 percent increase in the number of cases over the last two years. Among the female cancer patients in the city, breast cancer has the highest percentage – 27.5. Dr. Soumya Holla, Breast Cancer specialist at Apollo Hospital urged women to have regular checkups. She said, “ no women should think that their problems can wait.” Another focus of the marathon is encouraging the culture of “baby-wearing”. It is a traditional practice by mothers to carry their babies in a baby carrier attached to them or by tying a cloth around their body. Riva Sahani, one of the panelist said, “baby-wearing is a culture that needs to come back to modern society. When the baby is close to the body, it induced oxytocin release that in turn helps in breastfeeding.” Pinkathon encourages baby-wearing mothers to participate and they have created a breastfeeding corner exclusively for these mothers.